Instantly nourishes skin with vitamin-E rich Moroccan argan oil and precious Damask rose. Phyto-active marine algin is combined with hyaluronic acid and peptides known to stimulate collagen synthesis and improve the dermal extra cellular matrix for firmer, smoother skin. Light responsive tonka and deeply moisturising shea leave skin supple and naturally radiant. 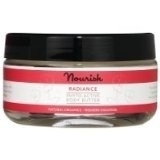 Smooth Nourish Radiance Phyto-Active Body Butter over the skin and lightly massage in. Aqua (water), Aloe barbadensis (aloe vera) leaf juice powder*, Glycerin, Argania spinosa (argan) kernel oil*, Vitellaria paradoxa (shea butter sp. nilotica)*, Palmitoyl tripeptide-5, Cetearyl olivate, Sorbitan olivate, Cetearyl glucoside, Algin, Alginic acid, Lactobacillus/dipteryx odorata (tonka) seed ferment, Leuconostoc/radish root ferment, Glyceryl stearate, Sodium levulinate, Levulinic acid, Rosa damascena (rose) flower extract, Xanthan gum, Sodium hyaluronate, Potassium sorbate, Citronellol, Eugenol, Farnesol, Geraniol, Linalool. *Organic ingredient. Naturally present in essential oils.